Michael Borden has a Master's Degree in Architecture from SCI-Arc in Los Angeles. He comes from a family of builders, with over 25 years experience in building and/or designing custom residences in California and the Midwest. He is currently involved in Vastu building and design projects worldwide. 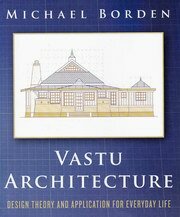 Michael was drawn to the endeavor of creating this book for the purpose of promoting Vastu Veda and thereby educating designers, architects, builders and homeowners on the potential of a more comfortable, happy and successful life lived in harmoney through the principles of Vastu Veda. I've known Michael for many years having once met him whilst visiting Dr. Sthapathi in Chennai on my quest to understand the Vedic science of matter and form and light and sound called Sthapatya Veda. Michael was fortunate to be the first student from the West to study with Dr. Sthapathi and this book is very much long awaited. It is a very comprehensive and practical book that will help anyone to grasp the key concepts of Sthapatya Veda. Highly recommended for all sincere students of Vaastu. I've known Michael for many years having once met him whilst ..